Woven Wood Shades. Design by Studio McGee. From countertops to cabinets, designing a kitchen involves coordinating multiple surfaces, colors and textures. Finding the perfect combination that looks great together and fits your vision can be tough. Throw in window treatments that are functional and attractive, and all the decisions can seem downright overwhelming. In this post, we’ve rounded up a few of our favorite kitchen window décor ideas from some talented interior designers. Woven Wood Shades are an excellent choice for kitchens. They are easy to operate, can act as light filtering or blackout treatments depending on the material and lining, and come in more than 85 colors. Choose a material that picks up on the warmth of natural wood tones elsewhere in your kitchen. Studio McGee used open shelving to keep the Tudor kitchen shown above light and bright. 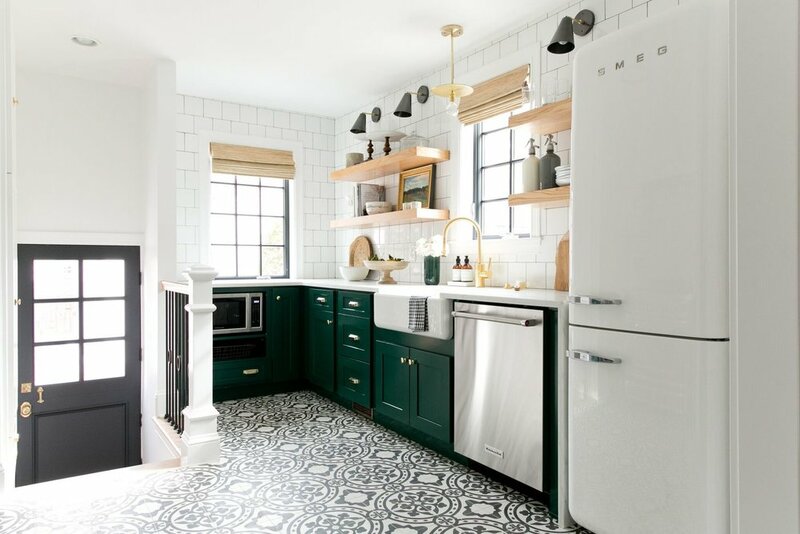 Woven Wood Shades in a coordinating tone were a logical choice to add interest to the white subway tile without competing with the forest green cabinetry. Woven Wood Shades. Design by Elizabeth Lawson Design. You can also coordinate Woven Wood Shades with the finish of your hardwood floors. Elizabeth Lawson Design used white and cool gray on this kitchen’s cabinets. The woven window shades visually link the walls with the rich color of the floors, keeping the space cozy and intimate. 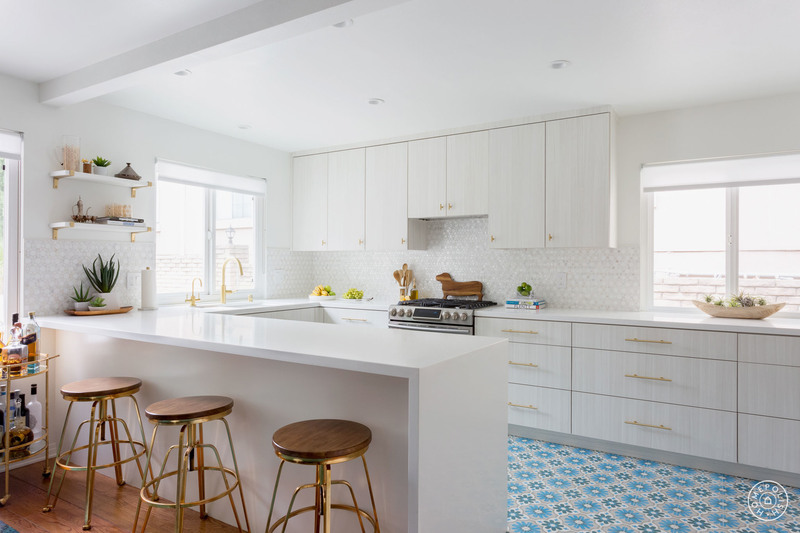 If you have a statement piece in your kitchen, like the patterned floor in Daniela Malca Benloulou’s space featured on Homepolish, you can allow your window treatments to remain subtle and understated to let the rest of the room shine. Daniela chose simple white Roller Shades to block glare, and the textured cabinets and colorful floor take center stage in her bright Los Angeles kitchen. Using a monochromatic white palette with pops of color always results in a sleek design. Roller Shades. Design by Daniela Malca Benloulou. Photo by Amy Bartlam. 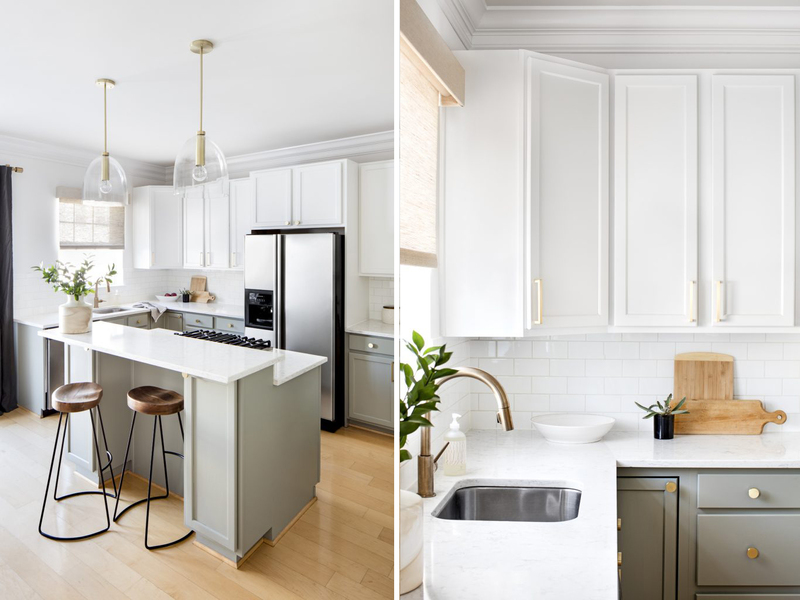 Color Theory Boston designed another beautiful white on white kitchen with a built in corner bench for the breakfast nook and white subway tile running all the way up to the ceiling. White Roller Shades add dimension to the windows and can also be wiped clean. Blue cushions and patterned throw pillows add life and cheer to the breakfast nook while the Roller Shades fade into the background. Roller Shades. Design by Color Theory Boston. Browse our photo gallery and our Pinterest boards to find more inspiration for your kitchen window décor. Order free swatches of any of our window treatment materials to test them out in your space and see how they match with your paint, tile, and countertop choices as well. Our design team is always available via phone or email to answer any questions you may have.